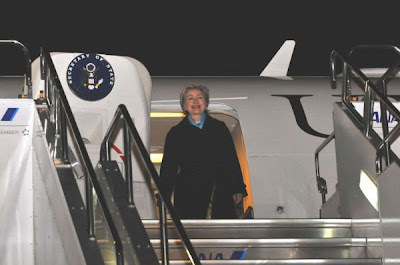 Today, Kralev’s On the Fly, his new weekly column is titled, “In air with Clinton on first trip abroad.” Looks like a beginning of a series on traveling with the secretary. Details include preparations for the trip, that is, visas, etc., the staff and press gathering at State for the ride to Andrews Air Force Base, to getting a ride in the Secretary’s reconfigured plane (the Air Force version of Boeing 757 for civilian use), the in-flight movie (“Juno”) and the dining fare (chicken breast and chocolate cake) -- on the first leg of their trip to Tokyo. Kralev writes that Hillary “kept a very busy schedule, and that kept us and the staff up most of the nights.” Um, I guess that's a signal for sleepy heads to stay home. He promises more about the rest of the trip in next week's column. If you’ve ever wonder what it's like traveling with the secretary of state around the world, this series might be worth following. Nicholas Kralev's TWT page is here.